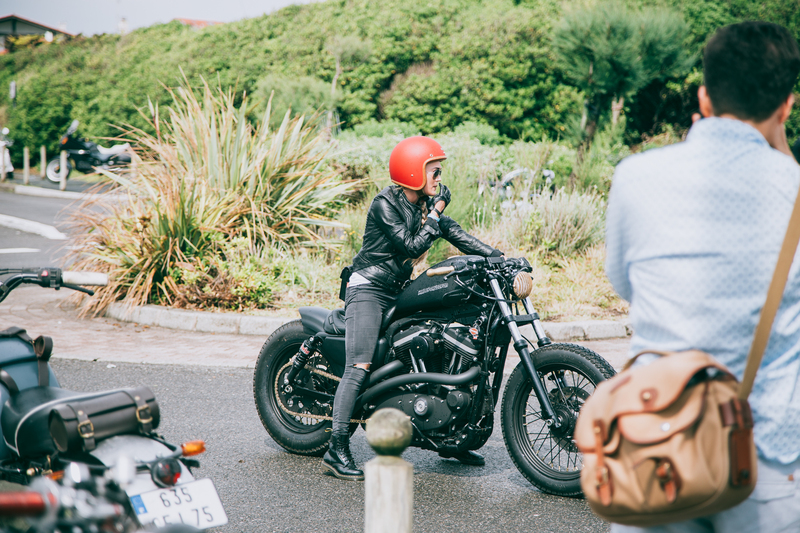 Two things that really don’t go hand-in-hand: motorcycles and surfing. It’s not like you can load a bike up with boards, invite your friends to hop on the back and set off for that hard-to-reach spot three hours down the road. 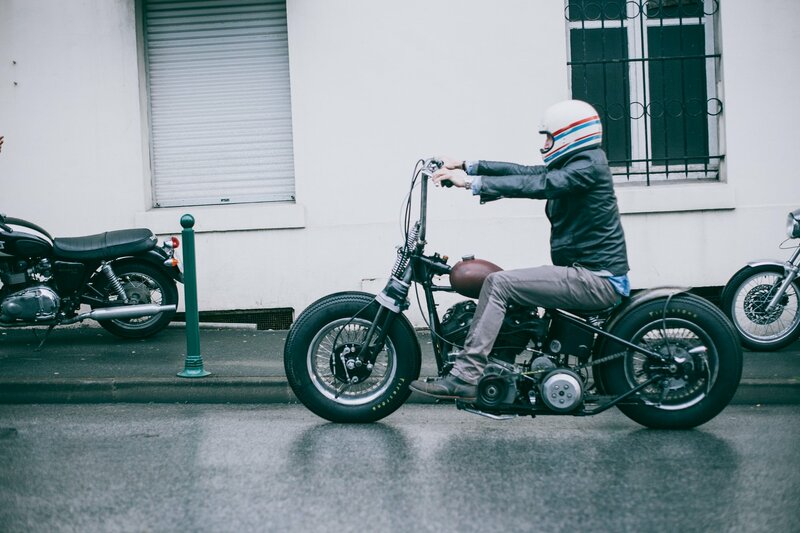 Two more things that don’t get along: bikers and rain. Finally, two more things that really don’t get on: surfers and prolonged periods of flat seas. 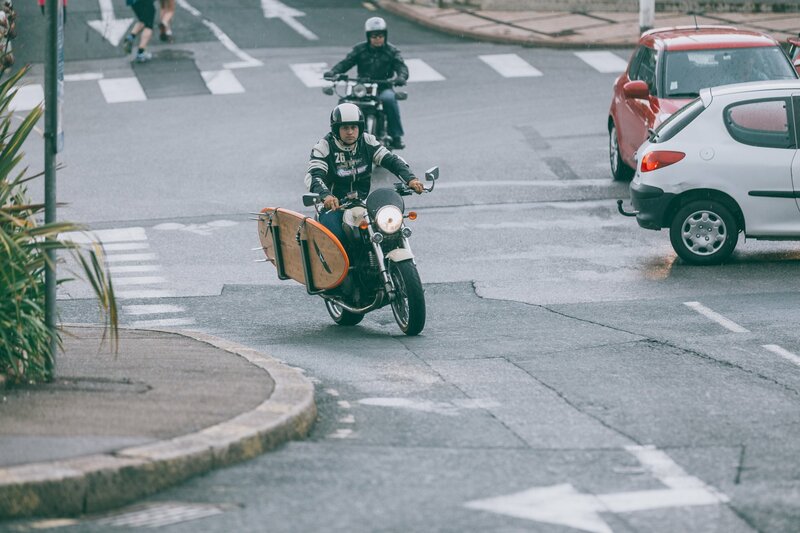 Last year’s Wheels and Waves festival in Biarritz, France, managed a full house of things that cause conflict – thousands of motorcycles, lots of surfboards but biblical rain and an Atlantic Ocean that represented a millpond. 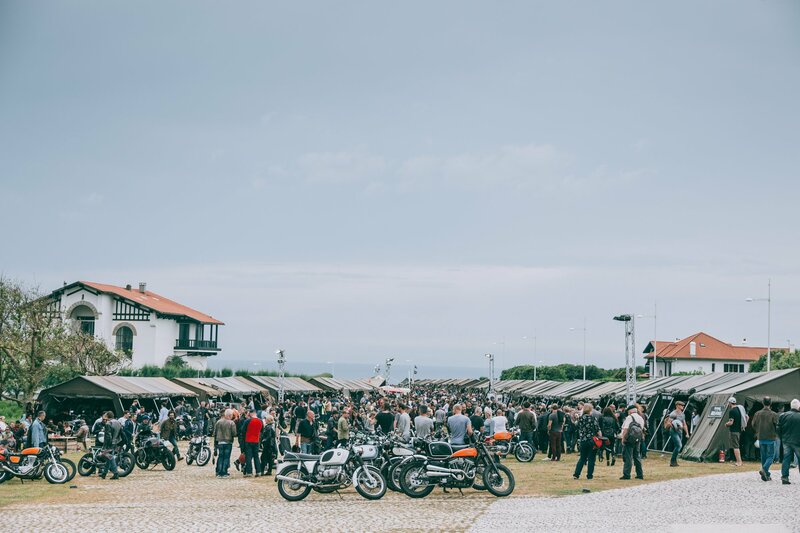 But still, hordes of achingly cool bikers managed to transform the sleek-but-sleepy Basque city into a hub of art, music, surfing, film, food and most importantly, ear-splitting motorcycles for one weekend and here’s why you need to put it on your bucket list. The annual festival, which was kick-started by The Southsiders, a group of Biarritz chums obsessed with surfing and racing vintage bikes, once attracted a mere handful of diehard enthusiasts but an explosion in popularity since its inception in 2009 means it is now a truly international event, with bikers travelling from as far as Australia to attend. A packed schedule sees four days of partying – the event kicking off in style with a super hip surf contest on the Thursday morning. 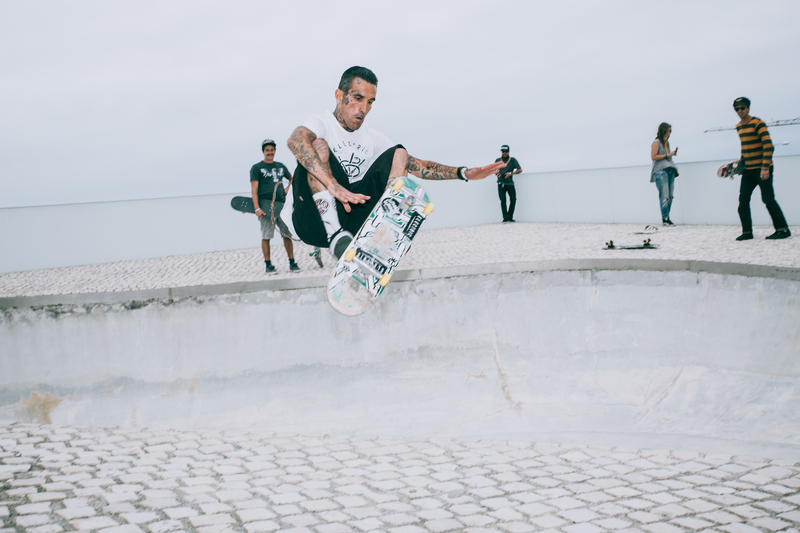 Typically, the comp attracts those with a vintage board collection: single fins, sun-bleached long boards and retro fish are a staple feature and the contest is judged just as much on style as it is on wave riding ability. 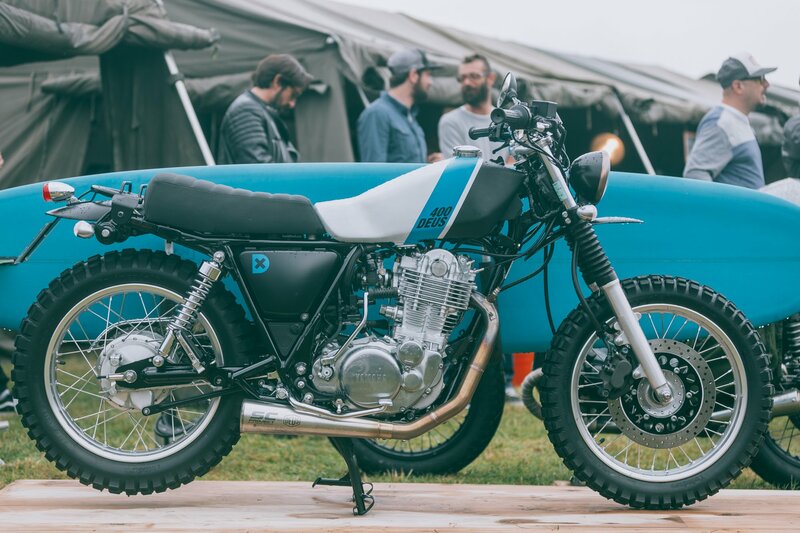 But most folk flock for the array of motorcycles: an absolutely stunning line-up of custom builds, café racers, scramblers, flat trackers and bobbers. 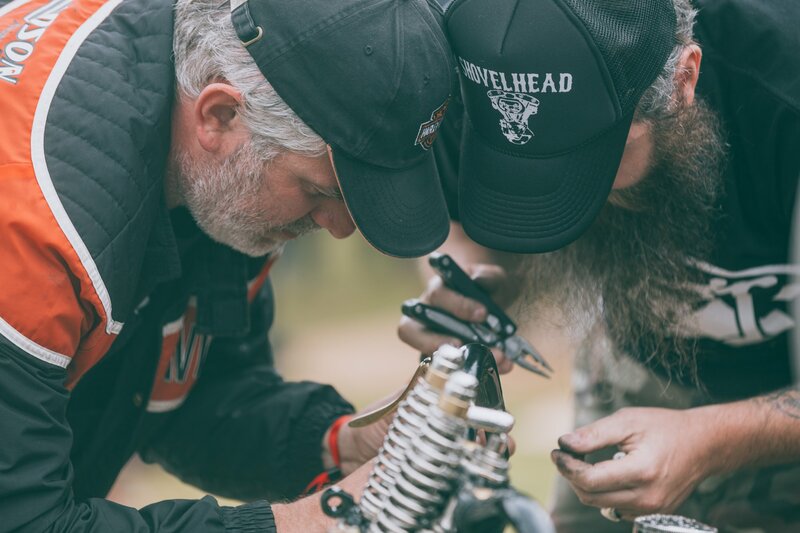 Basically, if your bike hasn’t been tinkered with in some way, isn’t of a certain vintage or simply isn’t cool enough, you’re not getting in. The sheer scale of the gathering means that the organisers have had to move the venue from its original venue at the famous Phare de Biarrtiz lighthouse to a much larger site at Cité de l’Océan. 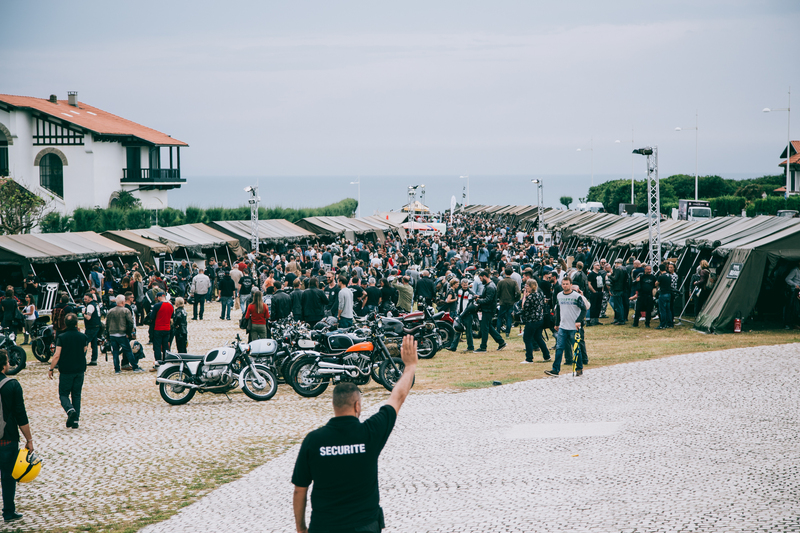 Household brands, such as Triumph, Harley-Davidson, BMW and Deus Ex Machina now partake in the event, spending the corporate dollar on tents and stands from which to sell their wares. But it still has a small festival feel to it all. 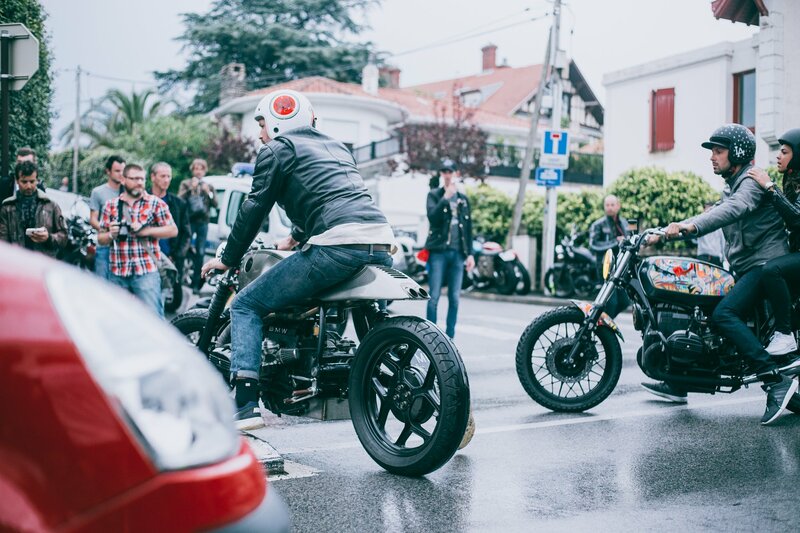 “It’s not as cool as it used to be,” says Stephan, a French biker from Paris and owner of a jaw-droppingly cool Honda CB400 Four café racer. “The festival used to be a lot smaller and it was much easier to meet up and chat with everyone. Now everyone knows about it and the big brands are involved, it has lost something and it takes ages to get a beer,” he adds. 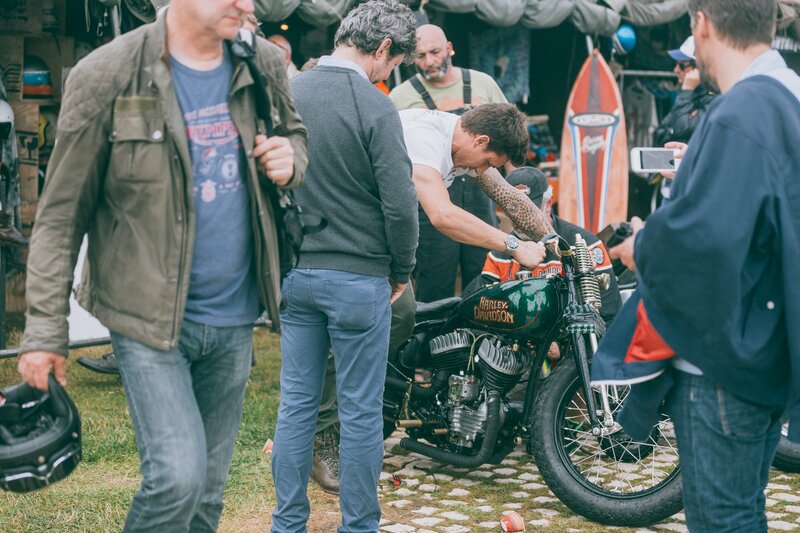 There is no pleasing the hispter set, but the event still attracts lovers of surf and bikes from all across Europe and for four days a year, Biarritz is abuzz with the sound of heavily customised two-wheeled machines, and the odd grumble from a man with a beard complaining that it has all gone “too corporate”. 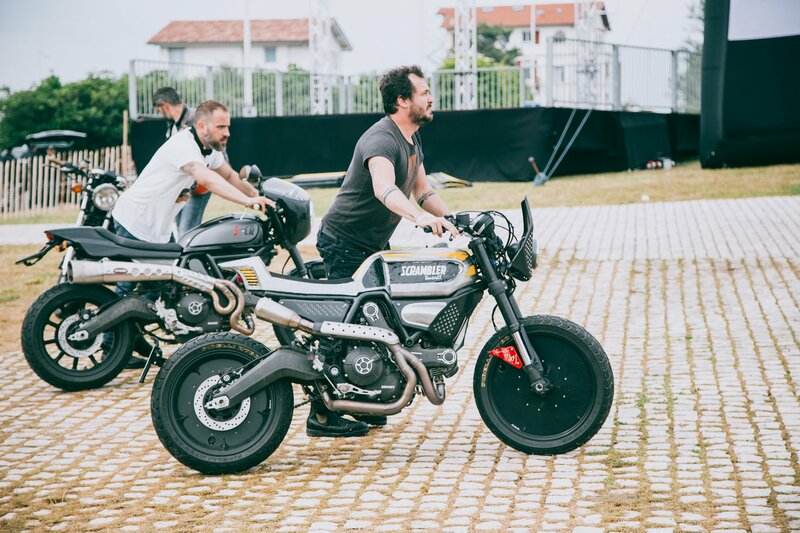 The stink of oil and the sound of un-baffled exhaust pipes can prove too much for even the most ardent petrolhead, which is why the Wheels and Waves festival offers more than just racing and rallies. Wetsuit manufacturers, home grown surf brands and local board shapers show up in their droves to peddle new products, while established brands like Electric, Deus Ex and Stance attract those keen on looking the part. 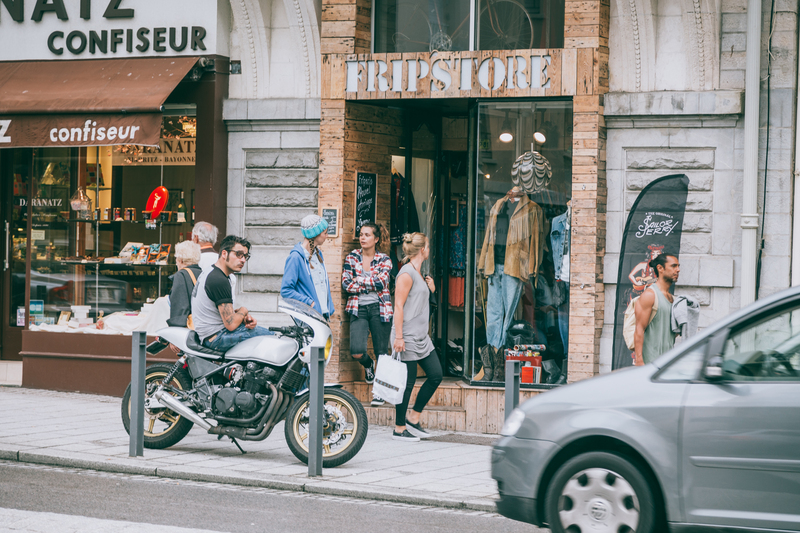 There is also a good smattering of surf shops from which to hire a board and suit should you decide to travel light and hack it down on two wheels. After all, Biarritz and its surrounding beaches can produce some world-class surf in the right conditions. La Plage du Pavillon Royal offers up a friendly low-tide right hander that peels off a reef point, a Plage de a Milady – which plays host to the Wheels and Waves surf comp – throws up some lengthy longboard-able lefts and rights, while Cote des Basques seems to be the place to escape the thumping beach breaks of la Grande Plage and Anglet. One brand of bike doesn’t dominate here. Head out for a walk around town and you’ll spot everything from a 1940s Norton to the latest BMW R nineT. 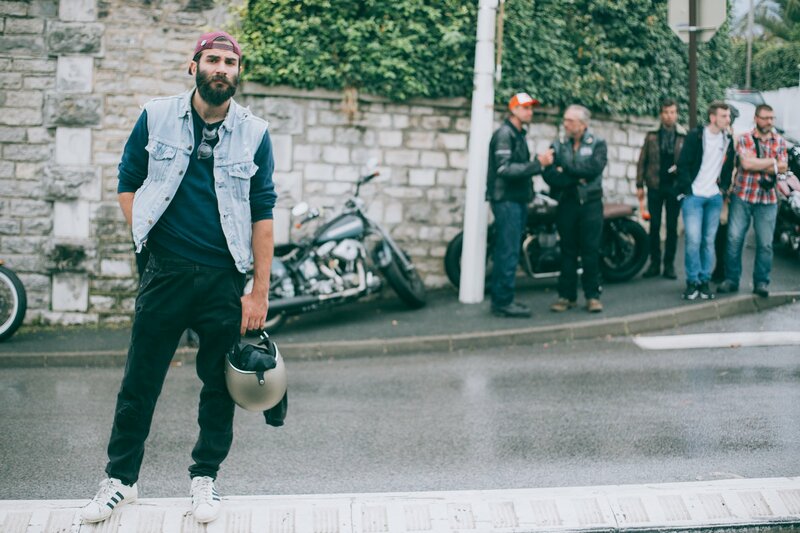 Attempting to blend in, we hopped aboard one of Harley-Davidson’s current Sportster models and made a beeline for Le Garage Foch on the Thursday night. The giant hangar in the centre of Biarritz hosts a sweaty mix of art and customised bikes. Paul Simonon, bass player in the seminal British punk band The Clash, stands in front of his current collection of paintings dubbed ‘Wot No Bike?’ He says that the art is inspired by his upbringing in London, where he found himself in a community of Bikers and Rockers that kick-started the punk revolution. 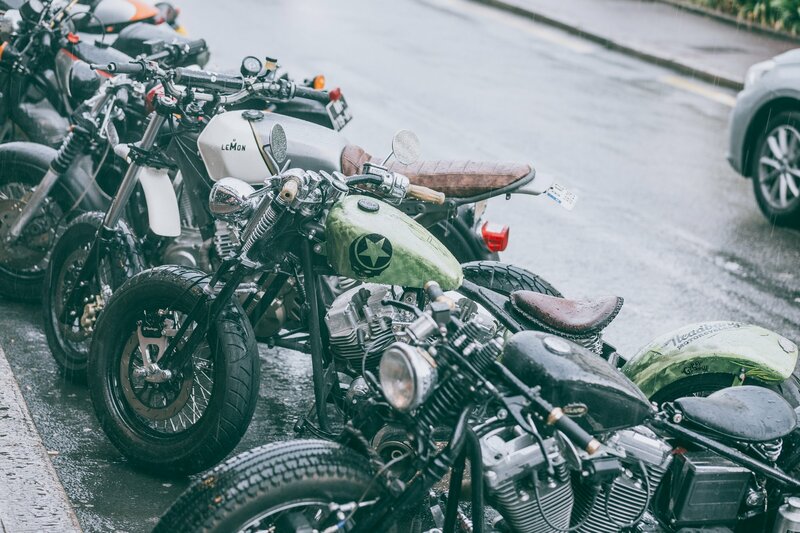 The images feature natty leather jackets, Triumph motorcycles, helmets and gloves, while bikes with painted tanks and fenders sit perched on old pallets in almost every direction. 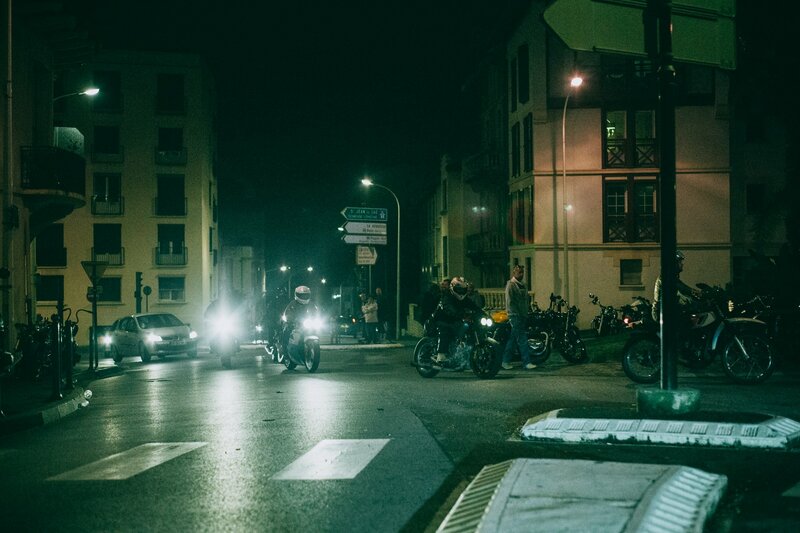 Throughout the evening, the roads outside of Le Garage Foch are jammed with bikes of every designation and as punters jostle to bag a beer inside, people begin to spill onto the streets to watch super stylish chaps blast up and down the tarmac on their chosen machines to cheers and whistles. 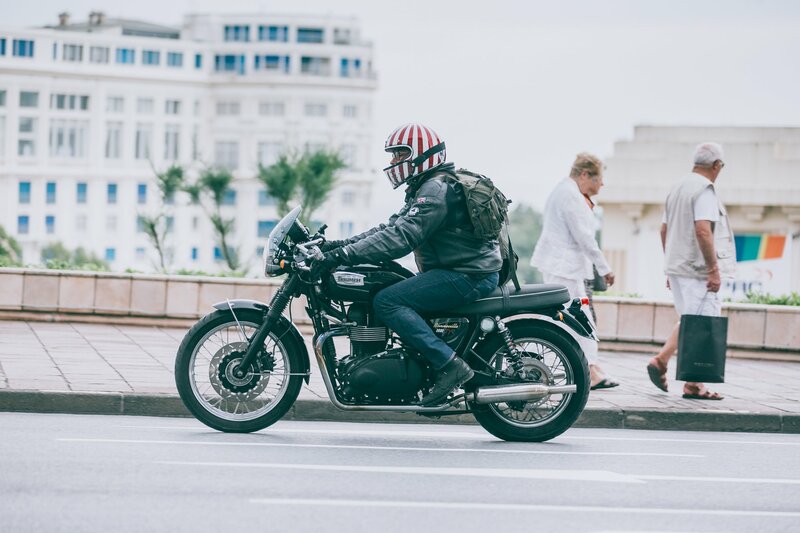 As the remaining light of a cloud-covered sun begins to fade, more people swarm the streets, the soundtrack of engines gets louder and the bars in Biarritz begin to bounce with folks in Red Wing boots and leather jackets. 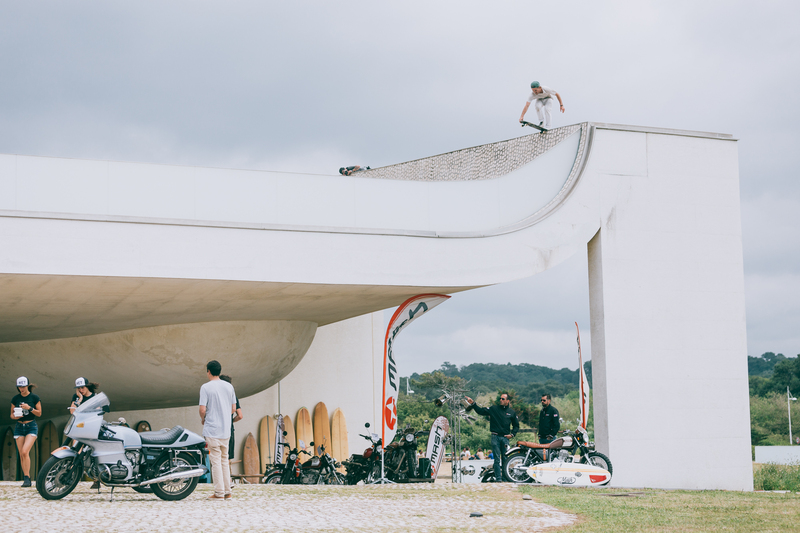 No one really knows if Cité de l’Océan was designed to look like a giant concrete half pipe but it does have a bowl on the roof and, thanks to a distinct lack of waves on day two, skaters have started tearing up the concrete out of pure frustration. But away from the festival’s main hub, the Jaizkibel mountain range hosts the infamous Punk’s Peak race. A total of 64 competitors embark on a high-octane blast along the twisting route in two-by-two formation. 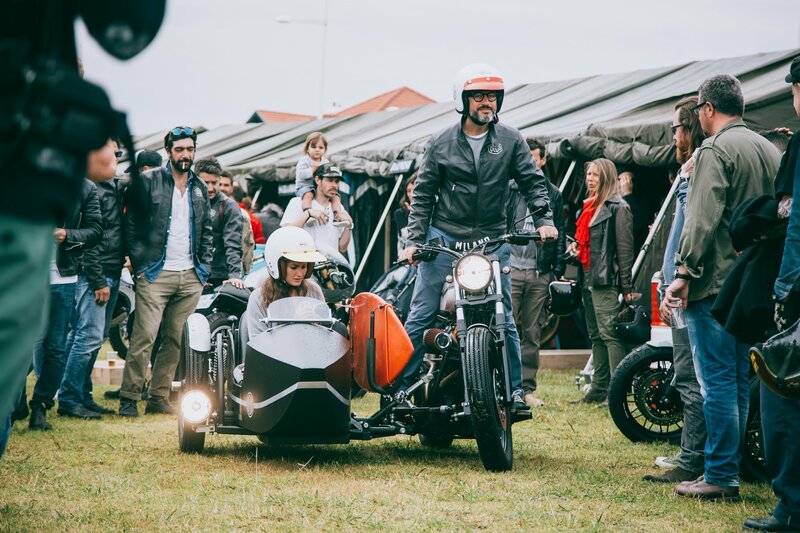 One man who has ditched the beer tents and hotdog stands for a day of wheel-to-wheel action is John Eldridge, a Newquay-based surfer, shaper, biker and owner of CMBL Customs. “We had to hire a van to get here because my original wagon conked out on me,” he explains as we stand at the start line and eye up the competition. “I don’t really do any racing at home but it seems rude to come here and not put my bike to the test against these guys,” he adds. His bike is a stripped-back Yamaha SR500 that has been cut down into a low-slung cafe racer. John is a braver man than we are, especially with those original brakes. Most of competitors are kitted out in stylish safety gear of a certain vintage. 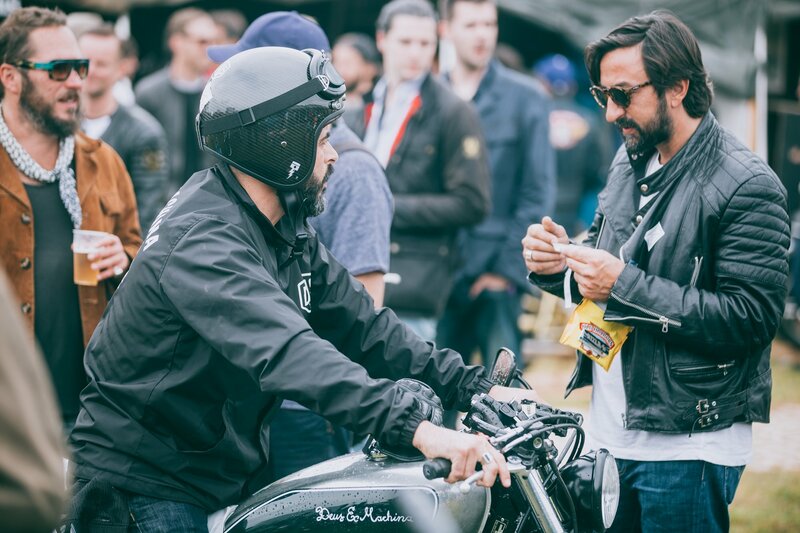 The festival organisers insist all kit has to adhere to the International Motorcycling Federation’s code of standards but these guys look way too cool to be safe. The bikes blast up Punk’s peak two-by-two, with the victor going through to the next round, while the loser gets to head back down to the main site for a well-earned beer while one of the numerous live bands play on stage. The waves picked up a tiny bit just as the festival was due to close for another year but the sun was out, the roads dried up and the various bars and cafes around Biarritz were lined with rows of parked metal. Even the locals seem to embrace the event, which is surprising considering the centre of town features an exclusive casino, Gucci shops and various hotels that cost in excess of €500 a night – a stark juxtaposition with the noisy bikes and bearded riders. 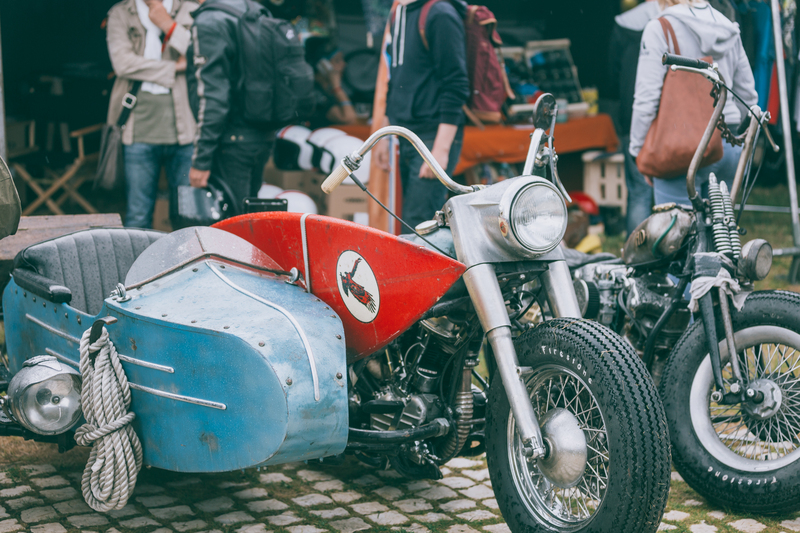 But that doesn’t seem to matter, even old couples shuffle along the rows of machines, appreciating the vintage BSAs, Triumphs and Harley-Davidsons. One octogenarian tells me he used to own a bike similar to the Norton Commando he is standing in front of. His wife has to drag him away before the owner convinces him to take it out for a nostalgic spin. Noakes rattles off some shots on his retro Canon camera, the results from which are sure to be a suitably cool tribute to the achingly hip festival.